We are delighted to be a part of the 2019 Hertford Arts Festival Trail. 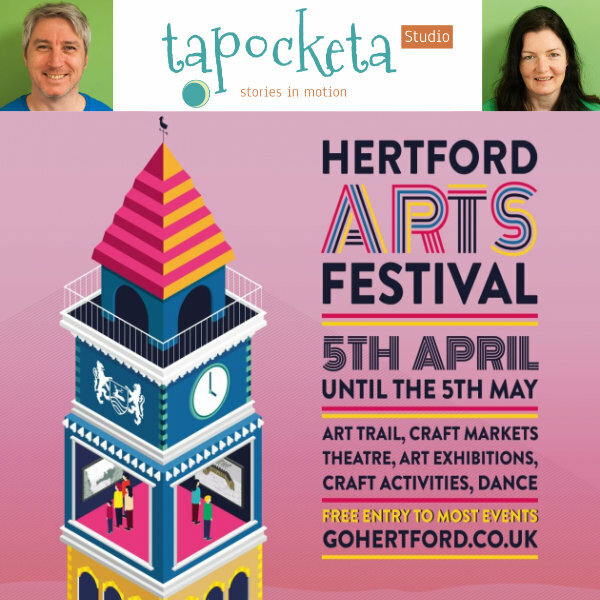 Created to promote local creators, the Hertford Arts Trail is part of the Arts Festival. Dotted across Hertford town will be a huge variety of artists exhibiting their work at various participant locations. McMullens brewery, the pride of Hertford, has kindly given over it’s huge window display to Tapocketa for the entire month of April ! We will be showing our colourful animation work on a big screen along with models etc. for the entire month. Best of all, the whole thing is free! Get your map of all the exhibitors on the trail here (we’re number 4 on the map). So why not plan out the whole day in Hertford, see the castle & grounds, visit the museum, perhaps even take in a show at the theatre and visit the exhibitors on the trail. We will also be at the castle on the 5th April to launch the trail along with the other exhibitors.